Revenge is a dish best served while riding off on a mountain bike. Or at least it is if you speak to vigilante cyclist Sharron Jenson. Sharron wasn’t always a private detective but after her bike was stolen from her local high-street and the police refused to help she very quickly became South London’s answer to Popeye Doyle. When she realised her bike had been stolen she did the obvious thing and contacted the police. Hell, Sharron even found out the thief’s first name, address and phone number, police refused to help her, so she decided to pose as a buyer and go to the thief’s home alone. The home-made undercover detective found out the thief’s address when she found her bike being advertised on Gumtree and after arriving at the house and meeting the thief she asked could she take the bike for a test drive. And then what happened? You got it. She sped off. PSYCHE! Shortly afterwards she called the police and once again informed them of the robber’s home and gave a detailed description of him but they continued to disregard the case saying that there is ‘insufficient information to proceed with an investigation’. It has made me realise how bad the state of police is here. It’s unbelievable that victims of crimes are having to investigate and then collect their own stolen items. And then nothing is done still. It makes me so angry. No wonder criminals think they can get away with it – because they can. I was nervous for weeks after I took it back. I didn’t sleep properly for days. I feel so angry and so helpless and feel like I am not safe. Sharron’s £700 bike was stolen from Kingston High Street on July 20 and she immediately reported the theft to police. She found it for sale on Gumtree five days later and got back in touch with the Met who told her to contact him posing as a buyer and arrange a viewing however after exchanging messages the bike was mysteriously removed from the site. They said to me to contact the guy, but not to go see him on my own, stall him and tell them, and they can see if someone can go with me to get it. 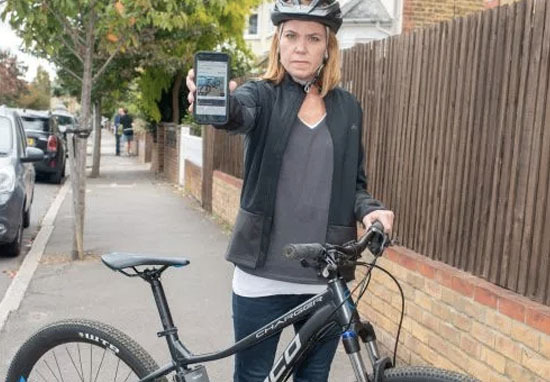 Nine days after her bike was first stolen it popped up on Gumtree again and texted the ‘seller’ offering £380 for the bike he’d listed for £420. She instantly recognised the bicycle because of the odd placement of the bell in the middle of the bars, and the seller handed over an address in Surrey. But when she got back in touch with police she claims they said because it had left London they couldn’t go with her. She claims they eventually admitted it was their responsibility after Surrey Police intervened – but then refused to join her for the collection. Sharron tried to pay workmen from a building site to accompany her but they refused, and 999 call handlers said they weren’t able to stay on the line while she confronted the thief. So a terrified Sharron went alone to meet the suspected bike nabber on August 1, parking a few streets away. We met elsewhere and walked to the house. He asked me multiple times to come into the house but I said no,” she said. It was really frightening. I thought ‘what am I doing’. I know he’s only a bike thief, but here I was confronting him. I was really nervous. In my head I was thinking ‘this is so dangerous’ but I knew it was my only chance. I cycled away and got to the corner and thought ‘it’s now or never’. I pedalled harder and harder and went faster and faster. I saw he wasn’t following me and just kept going. She went to the building site where workmen helped her match the bike’s serial number to the receipt stashed in her bra – confirming it was hers. The thief texted her demanding she bring it back and then later called – but laughed and hung up when she told him the bike was hers and accused him of theft. She contacted police once more – providing his name, the address he sold from, description and phone number – but said officers said ‘it was my word against his’. If they had come out when I had told them, they could have had everything they needed. I feel totally let down. At least she got the bike back though eh.